Mushroom foragers are having a heyday this winter. All over the Bay Area they're bringing home soggy buckets and heavy bags brimming with edible varieties, whether for themselves, restaurants, or farmers markets. After four years of drought, the moisture, temperature and light are finally ideal for fungi to thrive. The death cap mushroom kills and poisons more people every year than any other mushroom. This year the California Poison Control System received a record number of calls in December from foragers who accidentally consumed the toxic variety. Watch this video to learn more. 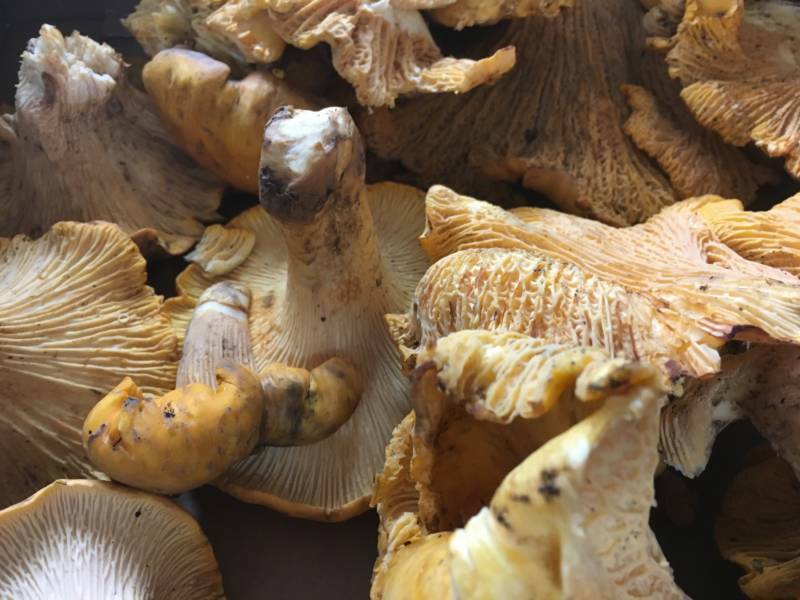 “Ahhh… chanterelle!” enthusiastically exclaims Brennan Wenck-Reilly, the president of the Mycological Society of San Francisco, who was foraging in a lush forest near Pacifica. He's uncovered a squash-colored trumpet mushroom underneath a layer of saturated leaves. He wipes off the gill-like ridges and sniffs for the characteristic nutty aroma. On a recent hunt in Mendocino County, Wenck says foragers simply stopped picking because the abundance was staggering. “If you really wanted to, you could have collected hundreds of pounds of this cocora that was just coming up everywhere," says Wenck. Coccora is one of northern California's most prized varieties. But foragers have to be careful, Wenck warns. He points to an egg-shaped white mushroom lurking behind the trunk of a large tree. The small fungi looks harmless, but it’s a death cap, easy to confuse with other wild varieties like coccora, caesar's mushroom or a straw mushroom. 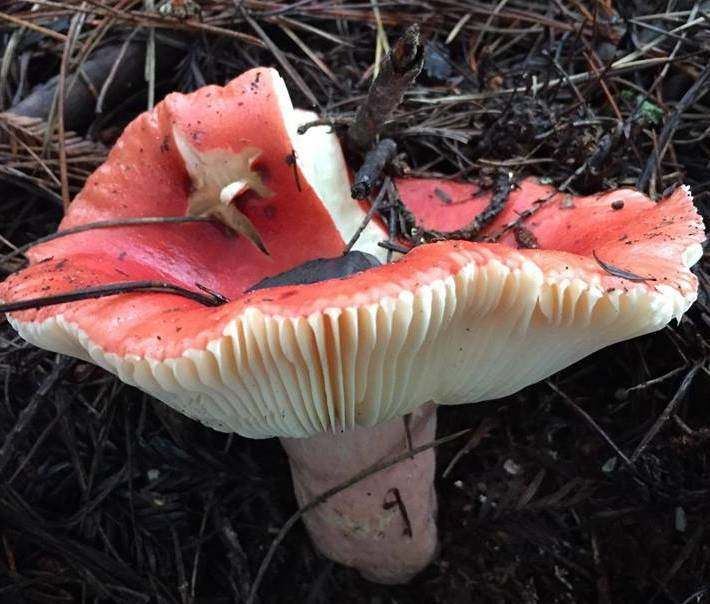 The California Poison Control System received a record number of calls from people who got sick from eating wild mushrooms in December -- although no one who ate them died. Even though fungi are prolific this season, there are some species foragers haven’t seen at all -- even with the rain. Mycologists aren’t sure why some mushrooms produced copious fruiting bodies this winter and others lay dormant. “We don't know a lot about the ecology of mushrooms in general, hence we don't even know how to get a lot of them to produce fruiting bodies for commercial production," says Wenck. "Some mushrooms, like white buttons, are really easy to cultivate, but most mushrooms are really cryptic in what gets them to actually grow. " It’s difficult to study fungi because most of the kingdom is actually invisible to us. The cap, or fruiting body, so easy to see on the forest floor is only the tip of a much bigger main organism called mycelium -- the root-like, feathery tendrils that thread underground, deriving nourishment from the soil. In fact the largest organism on the planet is thought to be a humungous fungus spreading for miles underground in the Blue Mountains of Oregon. But if a mushroom doesn't produce a fruiting body above ground, scientists have to search hard to find suspected fungi by taking soil samples. "If a biologist walks out in the woods they're going to see virtually all of the plants species," says San Francisco State University mycologist J.R. Blair. "If you go out during all seasons you're going to see all the bird species in a certain area too. But if the mushrooms don't produce fruiting bodies you're not going to know that they're there." The mystery of mushroom ecology and the unpredictability of mushroom caps is part of what hooks foragers, but they're not the only ones fascinated by fungi. Mushrooms are increasingly popular with foodies as well. Demand for commercially cultivated mushrooms has been spiking in recent years, with U.S. farms producing 25 percent more mushrooms today than a decade ago. The largest mushroom farm in North America is just south of Santa Cruz. Monterey Mushrooms produces about 120,000 pounds of mushrooms daily, most of it is just one species -- Agaricus bisporus, grown a few different ways. Most common is the white button. A cremini is the brown version. A portabello is the mature version. Portabellos boast the richest flavor because they have the least water content, leading to a more profuse mushroom flavor. The fruiting bodies grow at the rate of about an inch and a half a day. 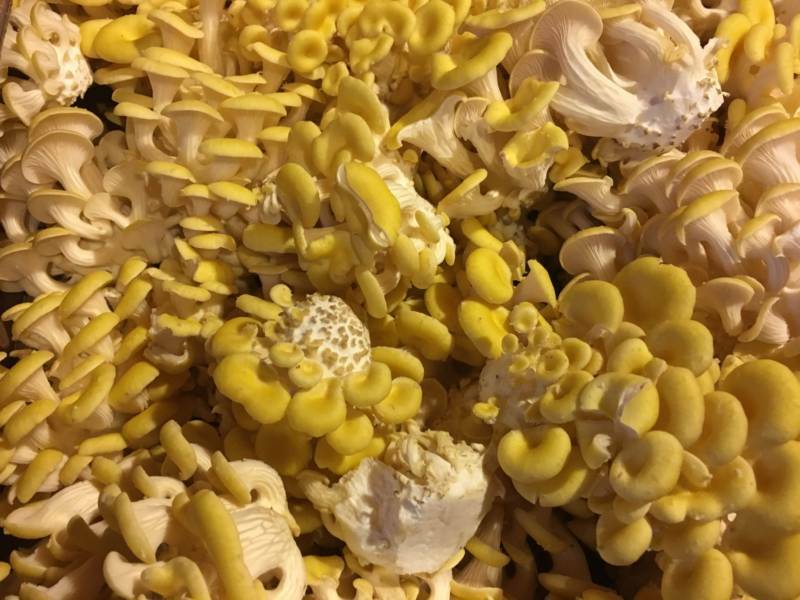 “They’re actually growing right in front of your eyes,” says Monterey Mushroom employee Matt Fuller as he swings opens the door to a dimly lit room inside a humid barn. Stacks of layered planter boxes brim with portobello caps from floor to ceiling. But Fuller says the mushrooms are actually not growing fast enough to keep up with increasing demand. The Mushroom Council, an industry group, credits the demand to consumers looking for nutrient rich alternatives to meat. But it’s not just the chewy texture of mushrooms that’s appealing; they’re also marketed as a superfood, and the trend has some research behind it. Biologist Christopher Hobbs says mushrooms are a nutritional powerhouse. Hobbs is also an herbalist and the author of the book Medicinal Mushrooms. “Three oyster mushroom fruiting bodies would be comparable to a half cup of greens that are cooked and two eggs, for instance,” says Hobbs. The United States Department of Agruiculture (USDA) says fungi are low in fat, sodium and cholesterol. 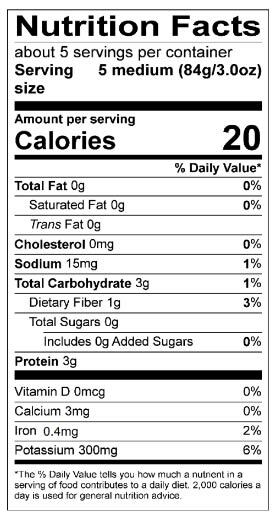 Plus they contain protein, vitamins and trace minerals. Academic researchers in both the U.S. and abroad are studying whether mushrooms can boost the immune system to fight allergies and viruses. Currently most of the science is preliminary, though Asian cultures have used mushrooms as medicine for centuries. “The oyster mushrooms and the shiitake are well-known to decrease cholesterol levels and also stabilize blood sugar levels,” says Hobbs. 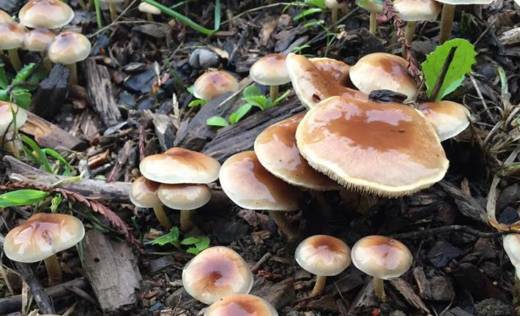 For example, researchers in Korea found that a mushroom extract reduced blood sugar in diabetic rats as effectively as the standard diabetes drug, metformin. More human trials are needed to confirm the research results found in animals. Western practitioners are beginning to follow the example of Japanese and Chinese doctors who use medicinal mushrooms in standard cancer treatment. 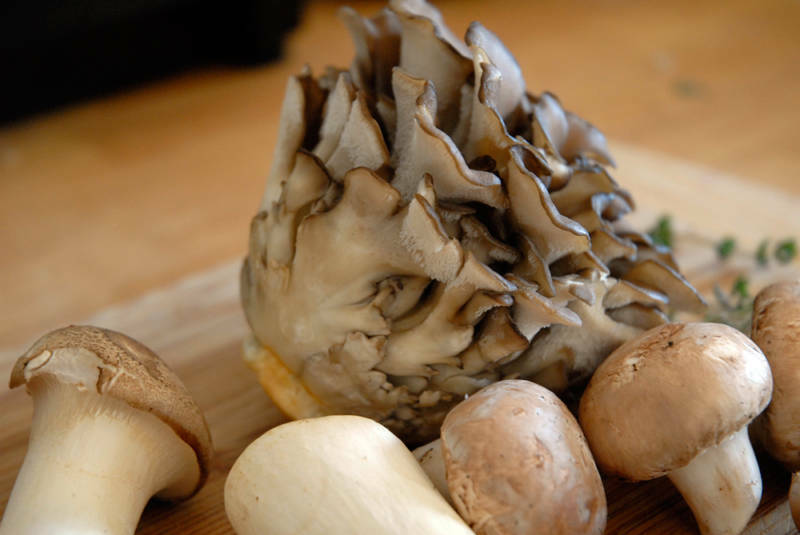 UCSF oncologist Dr. Donald I. Abrams recommends mushroom extracts to his patients to boost their immune response, complement chemotherapy or help with treatment side affects. He says each species has different health benefits. "For example, I recommended cordyceps to a recent patient who was concerned with his libido," says Abrams. Abrams is helping the National Cancer Institute compile a detailed review of all the animal and human clinical trials on mushrooms used to treat cancer. "Most studies to date have been done in China," says Abrams. "But we are quite American-centric and so anything done in another country tends to get discounted. I'm trying to present and assimilate the data for patients or practitioners who are interested in the research available on mushrooms." Abram says more research is necessary to conclude how mushrooms can fight cancer. "Yet, my patients don’t necessarily have time for the research to catch up, so I want to offer them something helpful that’s not likely harmful."